Hairline cracks can be challenging to repair. As the old adage goes, all concrete cracks. What's important to a client is that those cracks are not visible nor do they impact the performance of the countertop. 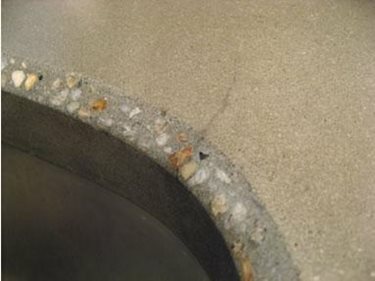 Well-made concrete countertops should not develop structural cracks. However, hairline cracks are possible, although not a sign of poor quality. Both hairline cracks and larger structural cracks are caused by stress relief. A crack forms when tensile stress builds up in the concrete and exceeds the material's capacity to resist those stresses. Most large structural cracks in countertops form because of flexing, either because a faucet was tightened too much or the house settled. Flexural crack from house settlement. 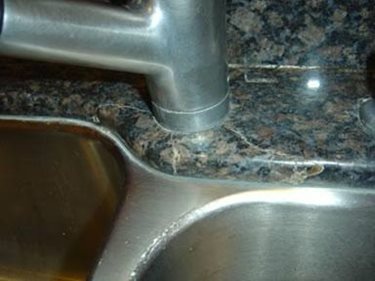 Cracks in granite from overtightened faucet. Multiple flex cracks in an overloaded cantilever beam. Hairline cracks often occur because of shrinkage, either from drying or from heat. These types of cracks are more difficult to control. Because they generally occur near the surface, reinforcing doesn't help prevent them. The best preventative is to use a good mix design that has low shrinkage tendencies. Still, hairline cracks can occur, and are often located near areas of moisture (sinks and dishwashers), where dry concrete repeatedly absorbs moisture and then dries out. Over time, these wetting and drying cycles will cause the concrete to crack, much in the same way a piece of steel will eventually crack if it's bent back and forth enough times. Hairline crack near a sink. Thermal cracking from a crock pot. Exposure to heat can also cause hairline cracking. Crock pots are a common source of heat- related hairline cracks in countertops. Often it's not the intensity of the heat but the length of time the concrete is exposed. Crock pots don't get very hot, but they sit in one spot for many hours. As the concrete heats it expands, and the more the concrete heats up and expands, the greater the thermal stress that develops. Generally, it's not just the heating that causes cracking, but also the subsequent cooling. As the concrete cools it shrinks, and this shrinkage causes cracking. 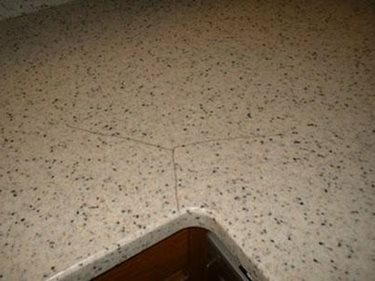 A repair in a hairline crack (or any crack for that matter) involves filling the crack with a material that will bond to the concrete, restore the appearance of the countertop and prevent the penetration of liquids that could stain the concrete. In addition, the ideal repair material is more flexible and as strong or stronger than the concrete, so that future cracking is prevented. Repairing hairline cracks can be challenging because making the crack disappear takes skill, patience, practice and a good eye for color matching. One definition of a hairline crack is a crack that hasn't opened up. That means there is very little room to fill it with anything but a very low-viscosity liquid. 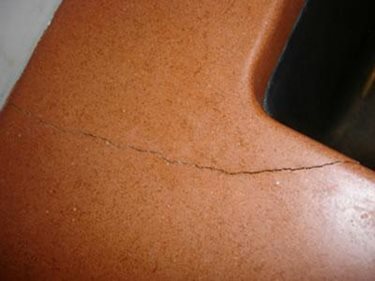 Since most hairline cracks don't affect the structural integrity of a countertop, sealing and concealing the crack are the main goals of a repair. The first step to repairing a crack is cleaning it. If oil or stains have penetrated the crack and have discolored the concrete, the stains will have to be addressed before repairing the crack (see How to Remove Oil Stains). If the crack is new and unstained, it may be possible to work more fresh sealer down into the crack. Usually rubbing the sealer in with gloved fingers helps to protect the concrete. To repair the crack, the sealer (or other filler material) needs to penetrate into the crack and fill it completely. Ideally, the sealer has a low surface tension so it readily wets out the concrete and a low viscosity. These two characteristics allow the liquid sealer to penetrate deeply into the crack. Common concrete countertop topical sealers can be used, but getting them to penetrate and fill a hairline crack can be difficult. Most concrete countertop sealers have a low solids content. But using a material with a high solids content will ensure that as the sealer cures, the material left in the crack does not shrink and pull away from the concrete or, just as bad, leave a void. A highly fluid epoxy (such as a flowable-grade granite epoxy) will fill and seal a crack nicely if you can get it into the crack. Keep in mind that materials like epoxy are effective because they wet out the concrete. Functionally, this helps to draw the epoxy into the crack. Aesthetically, this can make the crack darker in appearance, especially if the sealer used on the countertop does not darken the concrete as much as the epoxy does. The larger the crack, the easier it is to repair, simply because it's easier to get materials into the crack. There are commercial crack fillers/sealers available, but these are usually designed for larger, more open cracks. In addition, the aesthetics of the filled crack will fall short of what would be considered acceptable for concrete countertops. Crack repair materials for concrete countertops are often polymer-modified cement grouts, silicone or latex caulking, or epoxies. All can easily be color matched to blend with the existing concrete, but each has its pros and cons. 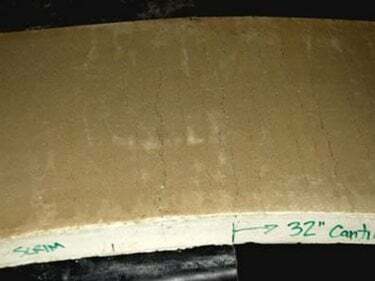 Polymer-modified cement grout is the typical material used to fill pinholes and voids in concrete countertops during manufacture. If cracks occur before the concrete is sealed, this is often the material used to repair them. It can also be used on larger cracks that occur in installed countertops, provided the crack won't flex or move. 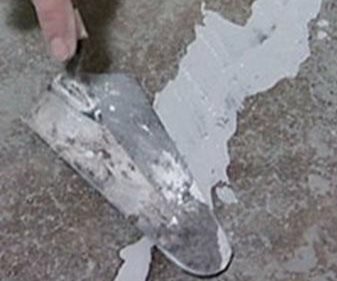 Cement grout can be difficult to work into tight hairline cracks, and often only covers the surface of the hairline crack without bonding the concrete together. Cement grout will also need to be sealed to prevent staining, and it is not very flexible, so future cracking could occur. Caulking, either silicone or latex-based, is relatively easy to work into cracks, but must be forced into hairline cracks. Caulk won't penetrate very deeply into the crack, so it's more of a flexible cap than a flexible filler. Caulk can react with bare concrete, and over time it will degrade, especially in wet areas. This may require sealing the crack with a low-viscosity sealer before filling the sealed crack with caulk. Epoxy designed for laminating natural stone is a good choice for filling cracks, and it often comes in two viscosities: knife grade and flowing grade. Knife grade is thick, much like Vaseline. Flowing grade is thinner and will more easily penetrate cracks on its own. Tinting epoxy is easy. Because epoxy is a two-component adhesive and will need to be applied fairly quickly after the components are mixed, it's best to tint one component of the epoxy before blending it with the other. This gives you plenty of time to get the color just right, without concern about the epoxy setting up before you can finish applying it. First, measure out both components according to the instructions and then select the component that is the most opaque. Add dry concrete pigments, epoxy dye or other compatible coloring material and blend until the color matches the concrete. Once you are happy with the color, mix the tinted component with the second untinted, clearer component.